Red Nose Day at Aveda Institute Nashville in Franklin, TN. A company’s culture is an intangible asset that, if properly cultivated, can do more to lure in prospective students and clients than any other facet of the business. Savvy school owners realize this and are spending just as much time nurturing their cultures as they are on practical business matters. When potential students tour these schools for the first time, the personality and vibe of the student body and staff is immediately apparent due to owners’ dedication to all the extras that round out their curriculum and enhance their culture. Excellence in Education applicants in the School Culture category can all agree on one thing—letting their students lead the way is key to creating a positive atmosphere. Student council, leadership teams, green teams, philanthropic and community service clubs—all of these student-led groups add to school spirit and give students a well-rounded education. At Tricoci University of Beauty Culture schools in the Chicago area, four distinct teams foster professional growth and specialized skills—the Retail Team, the TLC team (philanthropy), the Style Squad (an elite team for students with high attendance and GPA) and Student Council. From participating in community service events to becoming experts in retail recommendation, these teams foster participation in extra curricular activities and overall school spirit. “We encourage our students to take ownership of their educational experience by offering four student teams," says Lina Alvarado, Tricoci Univeristy of Beauty Culture executive director of education. "Each one provides a great opportunity for students to gain additional skills and develop stronger bonds with classmates and staff. Whether they’re leading green initiatives or coordinating student fashion shows, students feel empowered and excited by their opportunities in school. The days of only learning basic cuts and color are long gone. 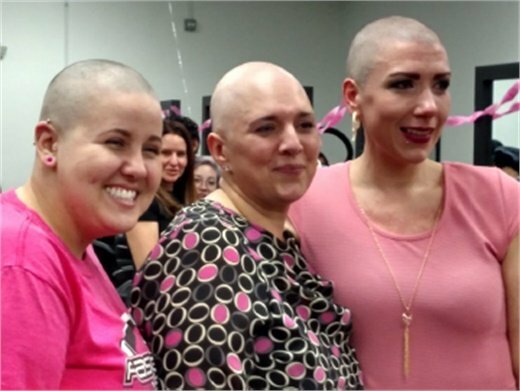 At Tricoci University of Beauty Culture in Chicago, student Jennifer Clark, left, and Campus Director Kate Sampson, right, showed their solidarity with Kellie Diaz by having their heads shaved during a fundraiser for Diaz's medical expenses. Nothing gets creative juices flowing like a good competition, and contests are a big part of cosmetology-school culture. Most notably, students are learning how to create entries for the prestigious NAHA competition and encouraged to enter the Beacon awards for students during the Professional Beauty Association’s Beauty Week. At Aveda Institute Nashville, a professional photographer is provided to capture students’ vision for a NAHA submission and start their professional portfolio during their last 10 weeks of the program. “Building confidence and inspiring our students to achieve their goals are key elements of our culture,” says Jordan Welker, director of Aveda Institute Nashville. “Entering national competitions such as PBA’s Beacon and NAHA’s Student Stylist of the Year are great ways for the students to gain experience, knowledge and techniques that will support them as they begin their careers. Social-media competitions featuring student work are also popular, with special hashtags to track progress and inspire creativity. Internal retail competitions pitting students against their peers for a fun reward at the end also remain popular. Competitions big and small inspire students, strengthen school spirit and cultivate culture—a win for everyone.